CLEARFIELD – A courtroom full of people applauded as Judge Paul E. Cherry was sworn in for his second term as a Clearfield County Judge. Those that came to honor Cherry included family, friends and colleagues. 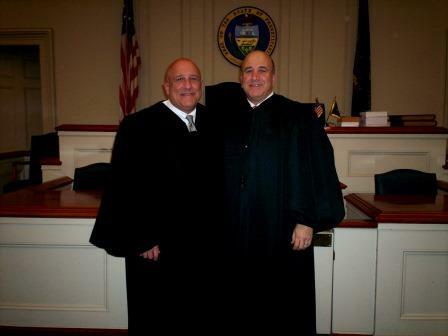 Cherry was sworn in by his brother, Dauphin County Judge John F. Cherry. President Judge Fredric J. Ammerman commented that it was both a pleasure and privilege to work with Cherry and he is looking forward to the next 10 years. Attorney Toni Cherry, who spoke at the ceremony, recalled attending the same ceremony for her uncle, Judge John Cherry 50 years ago. She stated that this past election was different than the one 10 years ago when Paul Cherry was first elected judge. She said this time people didn’t come out to vote for him because of his father, or because he did a great job as a district attorney, but because of how he executed his duties as a judge in the last 10 years. “He has been the type of judge he said he would be,” she said. She explained how when they were children their families would visit each other’s homes on Christmas but that tradition faded away. This Christmas Paul paid his respects to her mother with a Christmas Day visit. Choking up at this, she went on to say that this past Christmas would be her mother’s last as she has lung cancer. “She was thrilled he came to be with us that day,” she said, adding that she marveled at how humble he was and how lucky we are to have a man like this, so gentle and kind, as a judge in Clearfield County. Toni Cherry also commented that Clearfield County has two good men serving as judges who are dedicated to doing the right thing. Judge John Cherry said he also remembered his father being sworn in as a judge 50 years ago. He stated while he was peddling newspapers, he had photos of his father on the front and back of his bike as he did his part in the campaigning for his father. He lived the principles he preached and taught us the same values, he said. Judge Paul Cherry stated that 10 years ago, he told those attending his swearing in ceremony that his lifelong dream had come true. He noted that many of the same people were present again. He thanked his brother, Judge John Cherry for coming to Clearfield to administer the oath to him. “I’ve learned many things from him, some I can’t tell you,” Cherry joked. As he thanked Ammerman for giving him guidance, he stated they have a “fantastic working relationship.” He also thanked several family members for traveling back to Clearfield County for this occasion and his wife, Laurie, “who means the world to me.” His daughters, Gina, Melissa and Carla and son, Nick were all in attendance. As soon as Nick could walk he passed out nail files and said “vote for my Dad, Cherry stated. He told his cousin, Toni Cherry he was “humbled by her words” and hoped that he could live up to them. Although he is too young to remember his father being sworn in as judge 50 years ago, he did remember wanting to be a judge since he was in first grade. Cherry is a lifelong resident of DuBois. He graduated from DuBois Central Christian High School, Gannon University in Erie and the Dickinson School of Law in Carlisle. Prior to being elected judge in 2003, he served as Clearfield County’s district attorney for more than nine years and as a public defender for more than six years.